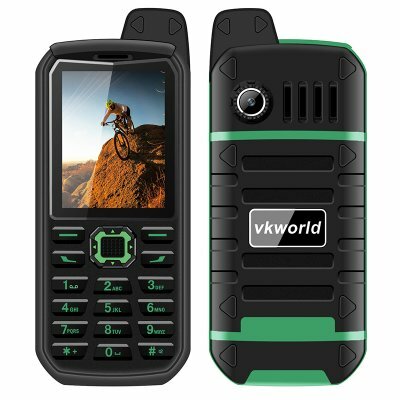 Successfully Added VK World Stone V3 Plus Rugged Elderly Phone - Bluetooth, Dual-IMEI, 4000mAh, FM Radio, IP54 (Green) to your Shopping Cart. With its massive 4000mAh battery, the VK World Stone V3 Plus allows you to stay connected to friends and family for a stunning 72 hours continuously. Additionally, this rugged phone offers up to 15 days of standby time for those of us who do not use their cell phone on regular basis. No longer will you have to fear about running out of juice, as this tough phone packs so much juice that it gets you through multiple days without even needing to think about recharging. Perfect for outdoor enthusiasts that occasionally head out on a hike or for elderly that do not use their cell phone daily - the VK World Stone V3 Plus is a budget phone that allows you to stay connected to friends and family at any time. Featuring an IP54 waterproof deign, this elderly phone is slash proof and will not be affected by rain or some drips of water. Its durable design protects this rugged phone also against dust, shocks, and scratches – allowing you to head out into the wild with confidence as not even the toughest of environments will stop this cell phone from operating. Additionally, the VK World Stone V3 Plus also comes packed with two SIM card slots and Dual-IMEI numbers – further enhancing your mobile connectivity no matter how far your upcoming adventure takes you. Added to that, this telephone also supports FM radio frequencies – letting you enjoy the news, latest songs, and your favorite radio talk programs at any time of the day. Packing an extra-large box speaker, this rugged elderly phone provides you with extra loud audio – making it perfect to be used by hearing impaired elderly. This affordable cell phone furthermore features extra large buttons and a bright 2.4-Inch display that portraits everything in clear detail, making the VK World Stone V3 Plus easy to operate by people of any age. Snap pictures on family gatherings and record your upcoming adventure with the phone’s sophisticated 0.07MP camera. With this little camera at hand, you’ll be able to capture all those special moments in life and share them later on with your friends and family back at home. The VK World Stone V3 Plus allows you to quickly expand the phone’s internal memory by adding an 8GB micro SD card, providing you with enough space to save all the pictures snapped with your cell phone. The VK World Stone V3 Plus comes with a 12 months warranty, brought to you by the leader in electronic devices as well as wholesale electronic gadgets..